Desert Hiking can be quite different from hiking through other terrains. On this page you'll find some of the tricks and tools that we've discovered to enhance our experience. Pleasant temperatures . The desert isn't always hot. Avoid the summer months. The winter offers great hiking temperatures. On the warmest days you can plan your hikes to avoid the hottest part of the day. The lack of biting flying insects is especially appreciated by those from northern states and provinces where we are plagued by mosquitoes and black flies for most of our hiking season. Off-trail hiking. The desert terrain allows you to see for miles and therefore invites hiking even in areas without trails. Without trees and less vegetation, it's easier to manage crossing the desert keeping a distant destination in sight. Diversity of terrain. We sometimes refer to our tours of the American Southwest as "Erosion Tours." Every area has been affected differently and carved by years of water, wind and ice erosion. The resulting variations in land formation include: canyons, natural bridges, arches, windows, pinnacles, tuffas, slot canyons, hoodoos, badlands and sand dunes to name a few. An amazing diversity of unique forms all waiting to be explored and photographed. Solitude. You'll find plenty of that in the vastness of the desert landscape. Panoramic Views. 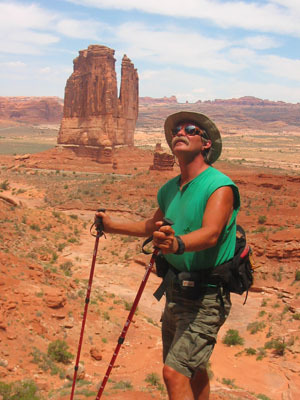 Desert hiking offers countless opportunities to climb rock mountains to gain vantage points for a great view. Plants and animals. The desert is home to an amazing variety of life forms that don't exist anywhere else. Besides the heat, there are other reasons to limit desert hiking to the winter months. You still need to carry plenty of drinking water although not nearly as much as in hotter temperatures, but it doesn't have to weigh you down. We've discovered that using waist packs lets us carry enough water for a day-hike of perhaps 6 or 8 hours (2 full 1-liter Nalgenes per person). With the weight directly over our hips, we barely notice we're carrying any weight at all. Most people are afraid of snakes but the poisonous variety, rattlesnakes, are almost never seen in the winter months when we do most of our desert hiking. They only appear when the days get hotter and spring moves into summer. Even then, common sense and caution can help you avoid an encounter. Since most of the rain falls in the summer monsoon season, the danger for flash floods is not very high in the winter months. Even so, it's important to check the weather forecast for the entire area if you're hiking through a slot canyon. A flash flood is caused by water gathering from rains that can fall in areas far away. Don't camp in washes and remember that just because it's not raining where you are, doesn't mean you're safe from a flash flood unless you're on high ground. Most vegetation in the desert has thorns or cactus barbs attached, but because the vegetation is also sparse (except for in the washes) it's easily visible and usually avoidable even when you're hiking off-trail. As with any activity, the right tools make a big difference. Fortunately hiking isn't an expensive sport and you don't have to spend a lot of money. We've found excellent deals on barely used, almost new hiking, backpacking, and camping gear. Here are some of the great items we've discovered and would not be without when desert hiking. As with any recommendation I make on this website, the costs fall into the frugal (great value for the money) category. in Natural Bridges National Park. Cooling Bandana An inexpensive way to stay cool that really works. Just soak this special silicone-crystal-filled bandana in water for about ½ hour before you start your hike and it will cool you for the entire day. It works especially well in arid desert conditions. As you hike just give the bandana a twist every so often to expose your neck to the cool side. taken on a hot hike at Lee's Ferry. Another tool we love that keeps us cool on a hot day. It requires carrying another item, but we never regret it because it's lightweight,uses regular tap water, requires no batteries and can be strapped across your shoulder or waist. We have the 10 oz pump and it keeps us cooled for a full day-hike. (For extra hot days, add ice to the water.) It also serves as an emergency back-up water supply. Misty Mate makes a personal, portable air cooler that can lower temperatures by 30+ degrees and no battery or power source is required. the Fiery Furnace Hike at Arches National Park. (Also called trekking poles.) You can spend a lot on these, but we've discovered a great find made by Swiss Gear and sold in the sporting section at Wal-Mart stores. They're shock absorbent and work great for a fraction of the cost. Only $10.00 compared to other poles, which run $80.00 to $100.00 at most outfitters. Truly a frugal find. Here's some feedback from other users. Some people use only one hiking pole. We use two and highly recommend it. The poles allow us to hike faster, assist in the uphill, give us confidence in our footing, provide stability for stream crossings, and we can use them to bang the rocks and make enough noise to warn snakes when desert hiking, or other animals (bears in bear country) of our arrival. Prevents strain on your back and neck. Allows air circulation on your back so you stay cooler. Distributes the main weight you're carrying (your water) evenly over your two hips. Holds all the essentials you need for a day-hike. 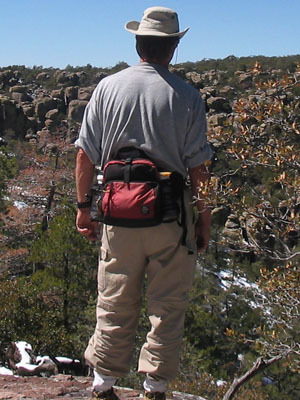 This gives you an idea of the size of the waist pack (and Randy's best side) as we hike through Chiricahua National Monument. A waist pack that can hold a liter of water on each side, and has enough space inside for your lunch and the clothes and items suggested below is a better choice than a small fanny-style pack which holds almost nothing but the water bottles. Buy a mid-size (8 to 10 L) pack. The difference in cost is minimal, yet it will allow you the room to bring the items you need. The larger size waist pack is still very light when empty. Even on the shortest day hikes we find that it's the easiest way to carry just 1 bottle of water, have our hands free, and not have to remember to bring our essential first aid-supplies since they're always in the pack. In this case we take just one waist pack between the two of us. For desert hiking, I suggest always keeping the following items in your pack (See the tips below as to why): Lightweight nylon wind jacket, nylon wind pants, a knife, lighter, comb, sunscreen, needle and thread, string, small mirror, compass, colored chalk, band-aids and alcohol wipes. If you always keep these items in the pack you only have to add your lunch and water and you're always ready to go. Here are some practical alternate uses we've come up with for items we're already carrying on our hikes. Nylon wind jacket and pants. Wear these to protect your clothes and skin as you find your way past the thorny bushes that often grow in a wash. The nylon won't catch on thorns the way normal clothes do. A comb will help you remove an imbedded cactus barb. Colored chalk Another off-trail hiking tool. Leave your mark on rocks at key points. It'll wash off with the next rain; so if you expect rain today, don't rely on this method. Building rock cairns (also called ducks) at strategic points is another method. Compass and Topographical Maps Getting lost in the desert is a life-threatening serious situation. Although the above methods may help you, you should not rely solely on them to keep you from getting lost. 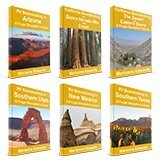 All off-trail hiking poses extra hazards and even an experienced desert hiker also needs to carry a compass, and topo map of the area or GPS with built in tracking features for hiking. And carrying them is not enough. You need to know how to use them! Here are some basic beginner's tips for using a compass and reading a topographical map. 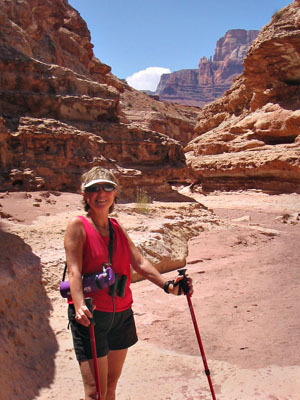 Even for women, hiking alone in the desert doesn't have to be intimidating. 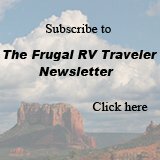 Check out Hiking Lady, for some useful hiking tips. 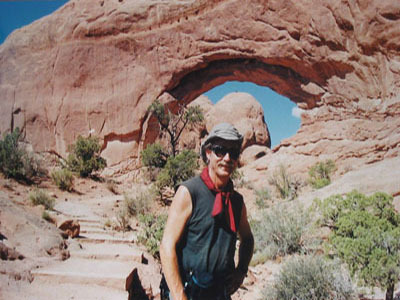 Properly equipped, everyone can enjoy a desert hiking experience!